Cleaning your fish tank regularly helps to keep your fish healthy and happy. It’s an easier job if you do it frequently so there’s less build-up of dirt and algae. This guide explains how to clean a freshwater fish tank. Assuming your fish tank has a filter (which it should), you will never need to change all the water entirely, or remove the fish. Your fish tank will adjust to the exact environment that your fish need to live in, and by replacing all of the water you will change that careful balance, upsetting both the pH and temperature which can shock and ultimately kill your fish. The power of your filter. The type of fish – larger fish and certain types can produce a lot of waste. As a rough guide, changing 10-15% of the water once a week is usually enough, but if any of your fish are sick, you should change more – perhaps 25-50%. If this is not keeping your tank clean and your fish happy, consider whether you are overfeeding or your tank is too small for the number of fish you have. These issues can result in a build-up of ammonia from excessive fish waste and excess food – look out for symptoms, the most common being your fish gasping for air at the top of the tank. An algae pad for cleaning the glass inside. Two buckets – one of which has not been used for anything else. A siphon - the gravel vacuum types that have a grill on the end to stop bits getting sucked up are best. A fish net for scooping up bits (not fish!). Filter cartridge or filter media if you are changing it this time. Never use household cleaning products in your fish tank as they can be very harmful to your fish. 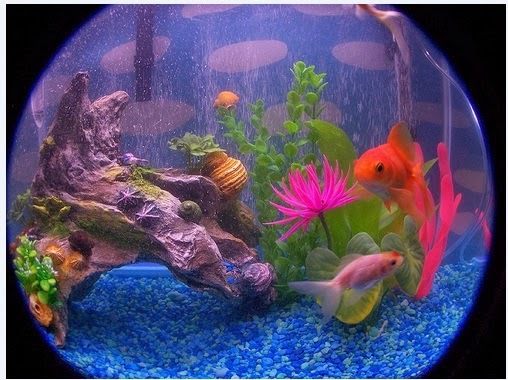 If you need to use a cleaning product, choose an aquarium-friendly cleaner. You should also avoid using anything you’ve used to clean your house previously, such as an old dishcloth, sponge, rubber gloves or cleaning bucket. These may have traces of household cleaner on them. You need to prepare the new water that you’re going to put into the tank in advance. Fill the clean bucket (make sure this is the one has not been used with household cleaning products previously) with the amount of tap water that you want to change and follow the instructions on your water conditioner to treat the water. This removes the chemicals from the tap water that would be harmful to fish. Leave the water in the room where the fish are as long as possible to allow it to reach room temperature as otherwise new water could cause a sharp change in temperature which could shock the fish. Use an algae pad to remove the algae from the glass inside the tank. You will find it works much better than a kitchen sponge or cloth. Then, remove any ornaments or décor from the tank and remove as much algae from them as possible. It can help to allow the ornaments to sit in hot water for a while, as this helps loosen the algae, avoiding the need to damage them by scrubbing. If you’re finding that algae is really building up in your tank, make sure you’re not leaving the light on too long as this can encourage algae growth. Anything over eight hours a day is too much. It’s time to make use of your siphon – put your other bucket below the level of your fish tank, put the smaller end of the siphon in the bucket and the ‘hoover’ end in the fish tank. Pump the siphon until it starts removing water. If you’ve got a siphon with a gravel vacuum/grill on the end, now is the time to ‘hoover’ the gravel the best you can. You won’t get all the dirt out but if you do this regularly, it won’t build up too much. Once you’ve got the amount of water out that you intend to replace, remove the siphon and empty the dirty water. At this point you’ll notice plenty of bits floating around the tank and you can make use of your fish net to clean them up. You only need to change the filter cartridge or media about once a month – if you’re doing it more often, there may be something wrong (for example, the tank is too small, you’re overfeeding or the filter isn’t very good). If you notice during a water change that your filter cartridge is looking really dirty (before it’s due to be replaced), it’s worth rinsing it off. Although some beneficial bacteria does build up inside the filter, there’s not so much of it that you’ll cause a problem by rinsing it now and then – but don’t do this every time as the good bacteria you’re rinsing away breaks down ammonia. You must still replace the filter once a month even if you rinse it now and then, or you will impact the health of your fish. Put your ornaments back into the tank and pour in the new water that you prepared carefully, taking care not to disturb the fish. Make sure you don’t overfill your tank as your fish need some oxygen-carbon dioxide exchange in order to breathe. Finally wipe down the outside of the tank, again avoiding household cleaners as the fumes can still hurt your fish. Including aquarium plants in your fish tank can help keep the water cleaner for longer. Besides looking pretty and providing shelter for the fish, the plants improve the water quality, making use of the waste in the water as fertilizer and oxygenating the water during the day, as well as helping to keep algae levels down. Algae itself is a plant so if your other plants are using all the waste as food, they can help starve out the algae. Some people also introduce snails to help keep the tank cleaner. Although algae is their favourite food and they do a great job of eating it all, they also produce a lot of waste. So introducing snails doesn’t always result in a cleaner tank - and some of them will eat all of your plants too.